An International day celebrated to familiarize the conditions of animals and to educate the masses to provide them a better status. This day also strives to spread the message that animals are sentient beings and humans should acknowledge and treat them accordingly. It is celebrated on 4th October every year. Did you know that the first World Animal Day was organized on 24th March, 1925 in Berlin? It was Heinrich Zimmermann, the German writer and publisher of magazine Mensch und Hund or Man and Dog who first organized this day. It was later moved to 4th October in 1929, as it is the day of Francis of Assisi, the patron saint of ecology. Zimmermann put diligent efforts to promote the World Animal Day and today it is celebrated with warmth and compassion worldwide. Many people and organizations have been sharing pictures and their joy across social media to commemorate the day. World Animal Day HQ posted and tweeted a series of pictures to share their joys and concerns regarding animals around the world. The organization posting this lovely picture on Twitter and Facebook requested its followers to add the frame as their profile photo. 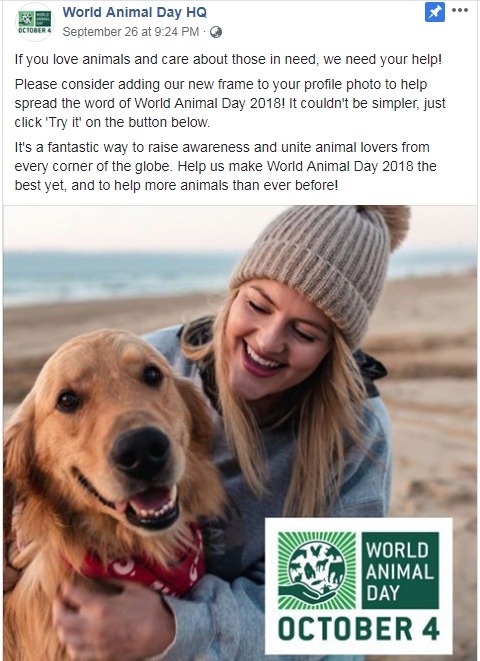 This is to spread the word of World Animal Day 2018 to raise awareness and unite the animal lovers from across the globe. They also tweeted this picture of the only pet cemetery of Myanmar showcasing the importance given to the animals by their owners. 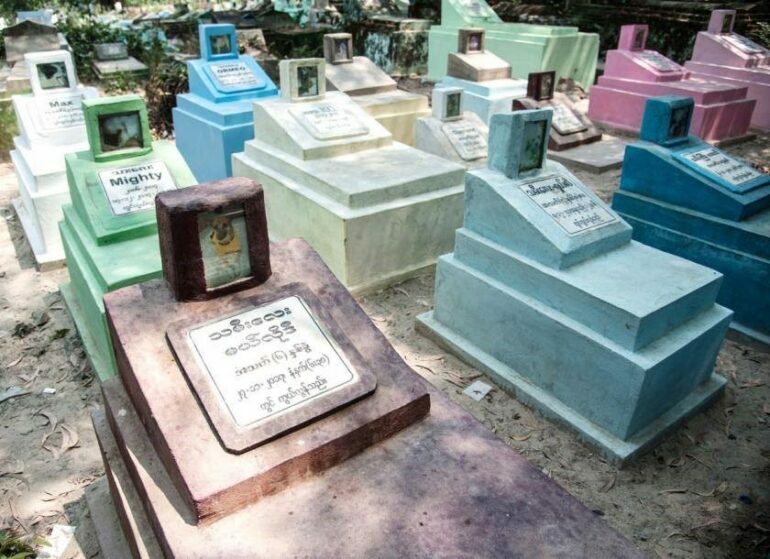 Myanmar’s only pet cemetery provides solace for grieving pet owners. The World Animal Day tweeted this victory wherein Nepal’s 300-year-old Gadhimai festival was discontinued animal sacrifice. 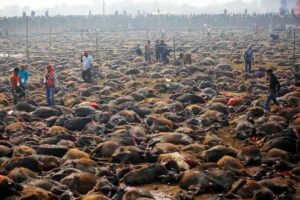 Gadhimai festival, that took place in Gadhimai Temple in Bara District, Nepal, was a sacrificial ceremony held once in every five years. It is primarily celebrated by Nepalese, Madheshi and Bihari people. In this occasion, several animals were slaughtered in the name of sacrifice to please the goddess of power, Gadhimai. The animals included pigs, goats, buffaloes, pigeons, and chickens. In 2015, this ritual was discontinued. 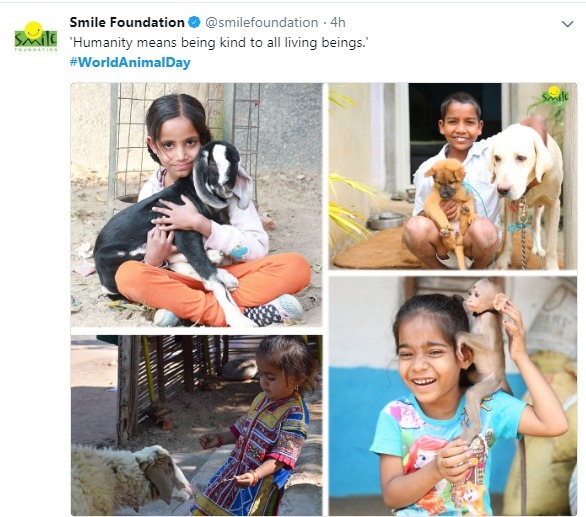 Smile Foundation, an NGO based in New Delhi, India also shared this picture on Twitter. 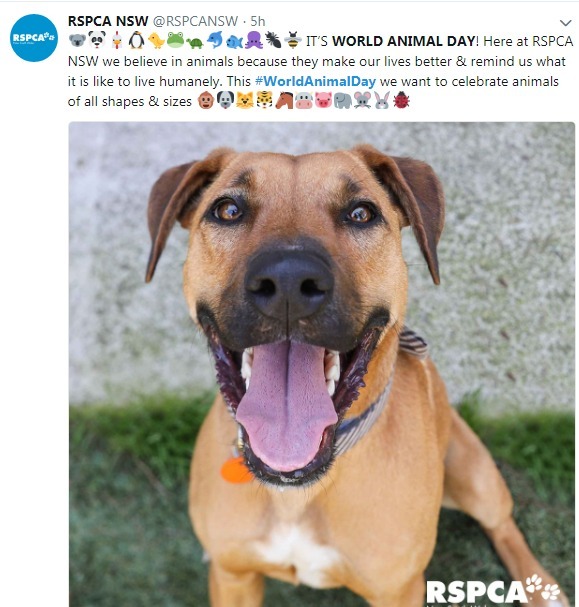 Here is another lovely tweet by RSPCA. Royal Society for the Prevention of Cruelty to Animals (RSPCA) is a non-profit organization which promotes animal welfare in England and Wales. Let’s all pledge to be compassionate towards these lovely creatures and strive to achieve the objective of this day by doing as much as we can throughout the year.